Exterior window shutters are taken for granted as an easy to install, quick fix to improve curb appeal. Unfortunately, few people understand the complexity of window shutters or the correct way of hanging shutters. What one thinks is a simple mistake will destroy a home’s curb appeal. Don’t let this happen to you! With historic wood shutters or plastic shutters, there is a LOT you need to know. Read on and we will insure your success with shutters and curb appeal. With a photo of your house we can also replace your plastic shutters with real wood shutters to show you the difference and how we can improve the curb appeal of your home. Historic shutters. Operable shutters are now added. 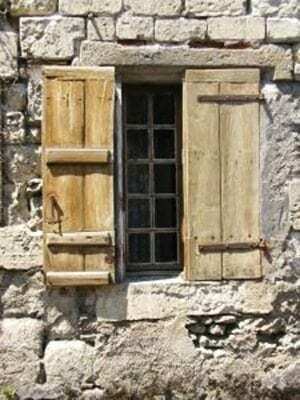 The History of Exterior Window Shutters and How They Were Used. 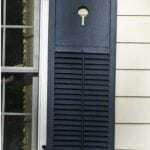 Window Shutter Mistakes – Exterior Shutters Today vs Historic Shutters. Exterior Shutter Hardware – Choosing the right Shutter Hinges. Examples of Good versus Bad Window Shutters. What Shutter Styles are Right for My House? There is a Lot More to Window Shutters Than You Think. Make one of the greatest impacts on the appearance of a house. Are a feature that is easy to add to your home. Provide the most bang for your buck in beautifying your home. Can ruin the entire appearance of your house if not done correctly. Yes, exterior window shutters, just as windows, can be your best friend or worst enemy. Exterior shutters can make or break the appearance of your house. Window shutters are the most abused in about 99% of homes. Yes, exterior window shutters can grossly subtract from a potentially beautiful house and make it look bland and out-right ugly! The good news is that the bad can easily be fixed and allow your house to come alive with beauty. Here we will explain what most homeowners and builders are doing wrong and how easily exterior window shutters can make your house pop with beauty. Exterior wood window shutters over the course of history were not only aesthetically pleasing but provided a necessary function with their many uses. 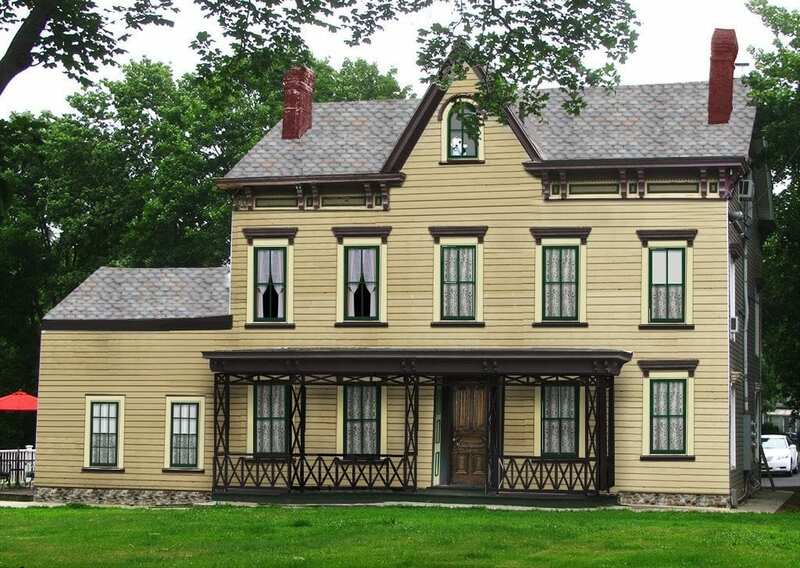 They were used for security, provided privacy from outsiders passing by, added an extra layer of insulation during winter weather (with wood having a high R value) and blocked out the sun, preventing damage to furniture. Louvered shutters allowed a breeze to enter a home, keeping the room cool on a hot summer day. Earlier historic shutters were used for security in place of glass windows. Shutters were either single board, or board-and-batten shutters (vertical wood slats) which were used on cottages and primitive buildings. Solid raised paneled shutters then appeared and provided a lighter, more elegant look. Fixed louvered shutters then came into use during the second half of the 18th century. Historically, solid raised panel shutters were referred to as “shutters” while those with louvered shutters were called “blinds”. To the right you see a photo of shutters from Thomas Jefferson’s Monticello (1772). Stiles and rails (the edges) on early louvered shutters were quite narrow. Notice that the shutter is mounted off to the side of the window casing. This mounting style was used only for early shutters such as these. 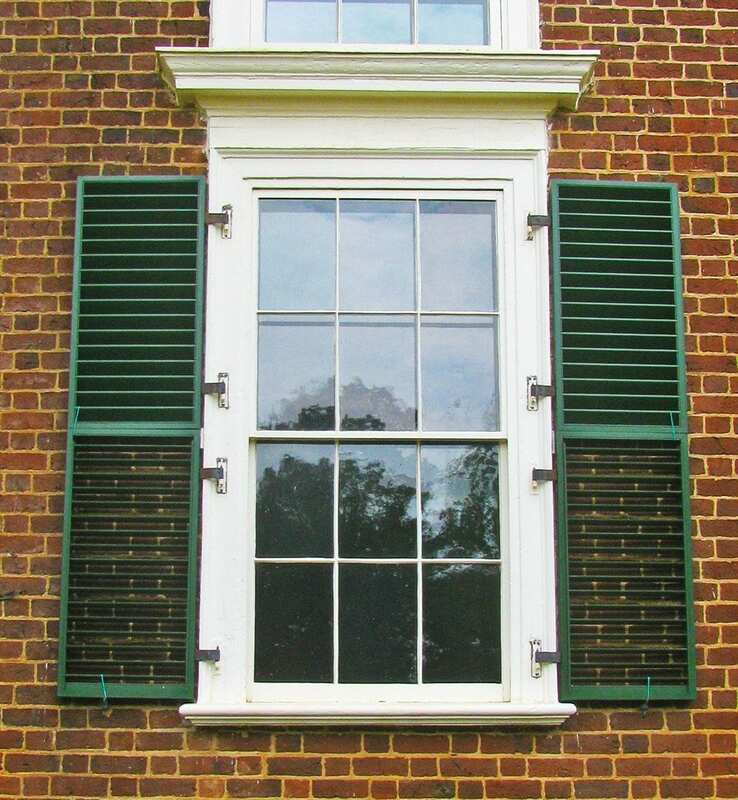 Many early louvered shutters when closed would not fit snuggly into the window but instead rest against the window sash and stick out from the window. 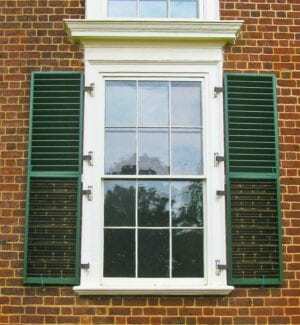 This window has a separate set of window shutters for both the upper and lower sash. Through the middle 19th century, most homes would have solid raised panel shutters on the first floor for privacy and security. On the second floor they would have louvered shutters to allow the breeze to enter during the warm months. Sometimes the first floor had white shutters. At night when closed a candle lit interior would appear brighter. Dark colored louvered shutters on the second floor would provide darkness for daytime napping. An individual window shutter could also combined both features – a raised solid panel on the lower portion and louvers on the top part. The example to the right shows an 1840’s window. The shutter on the left is installed graphically from an old sepia-tone photo. The shutter on the right is planned to be constructed by Shuttercraft to match. Historic Board and Batten shutters are used for privacy and security. 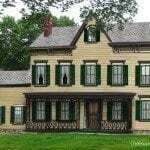 1861 Green louver shutters on top floor, white raised panel shutters on first floor. Click to enlarge. Original c. 1840 shutter from an old photo is pasted on left side of window. Reproduction shutter mockup by Shuttercraft on right. 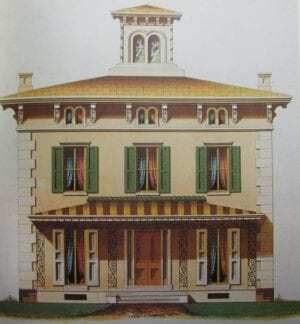 “Operable Louvered Shutters”, louvers that are regulated by a tilt rod began to be manufactured around 1830-1840. Before this the louvers were fixed in an open position. With the advent of the exterior Storm Window in the later 1800’s, shutters were sometimes removed and stored away before the cold months and wooden storm windows would be installed. Removal was easy – all you needed to do was lift the shutter off the pin on the hinge. Exterior window shutters could also remain on the building, left in an open position. If using storm windows, please note that this was all dependent on the type and mounting of the shutter hinge. It is possible that the storm window would not be able to be inserted into the window jamb if a shutter hinge was in the way. During the warm months, the storm windows would be removed and window shutters would be closed to protect furniture from the sun and allow outside air to cool the house. At the end of the Civil War, awnings (Preservation Brief #44 – Awnings ) became popular and window screens began to come into use. 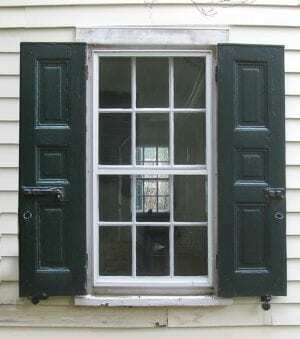 Screen windows were just like storm windows except they had screens in the wood frame. In addition to these screen windows, adjustable screens (The Adjustable Window Screen Company patent, 1866 ) still sold in hardware stores today, or lace curtains also served the purpose. Visit our page on storm windows and window screens . In some styles of architecture, exterior shutters also began to fall out of fashion. By the 1920’s, although some exterior window shutters were still used for practical reasons, most were strictly decorative. Those shutters that were purely decorative however, were still functional or had the appearance of being functional. Homeowners could operate the shutter to cool or insulate the home if they wished. 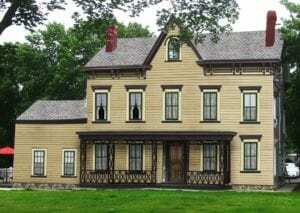 There was no difference to the appearance of the house. Unfortunately, this changed during the 1950’s with the advent of Aluminum Siding and Aluminum Shutters. This is when the dreadful problem we have today began. 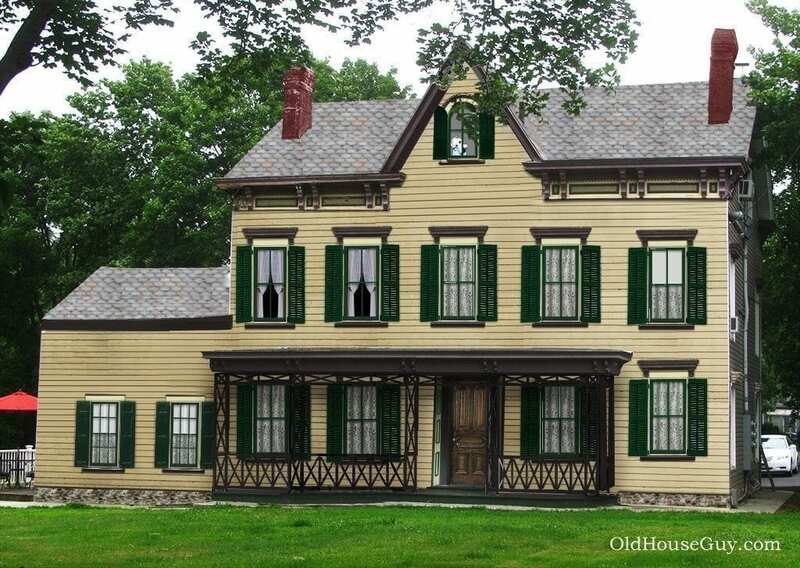 The public has always been in love with the warm cozy feel of a traditional styled home. Exterior wood window shutters provide that look and feel. Aluminum siding and fake aluminum shutters started to be heavily marketed in the 1950s. To simplify installation of aluminum shutters on aluminum siding, the method of installing exterior window shutters – hanging shutters changed. Window shutters began to be installed by screwing the shutter onto the siding NEXT TO, instead of directly on top of window casing, and without the use of hinges. This was easy and required minimal intelligence. Eventually, people became more lazy, less knowledgeable, and more insensitive to the appearance of their windows and began using the wrong size shutters. Before you knew it, they were putting rectangular shutters on arched windows and whatever else you could imagine! This is where we are today. 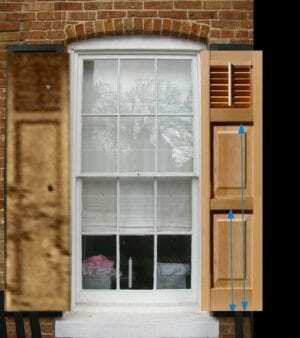 As you may or may not know, the window shutter has evolved in a grossly unfortunate way. Sadly, we too have evolved to accept this new bland look. It is now normal and what we expect to see when we look at a house with shutters. 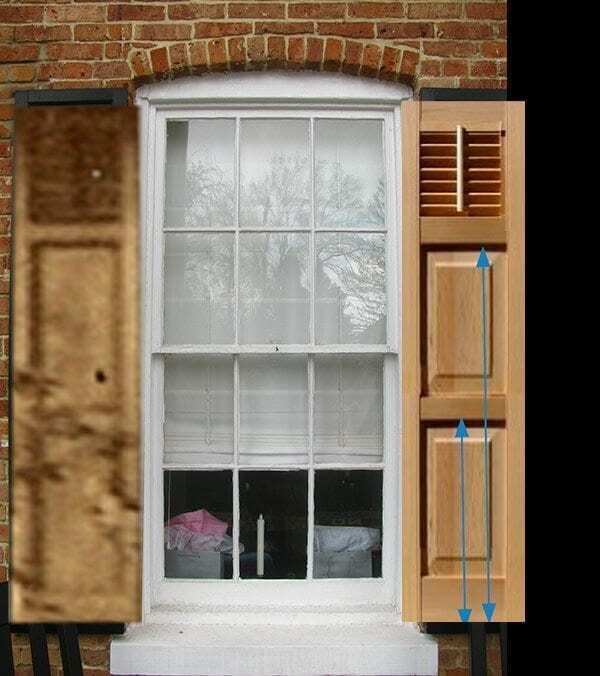 This is also what architects and builders do and what we see with many exterior window shutter companies. If you are not aware of the “bad window shutters” problem you soon will be. Read on and we will re-train your eyes to understand, see, and feel the impact of a architecturally correct and incorrect window shutter. You will be the expert. We use the term Historic Shutter to represent a visually correct, properly mounted and designed shutter, as all shutters should be, including those used with contemporary architecture. Hi! 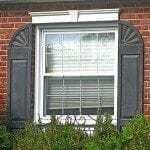 I live in Baltimore and have noticed that in certain historic homes in the area the shutters have candlestick, moon and/ or star cut outs on the shutters. I’m assuming this was a decorative touch . Do these cut outs have a particular symbolism? Or is it purely for decoration? That’s a 1920’s style. They could mean something to the owner at the time but no particular reason. What type of wood was most commonly used on these in midwest America ca. 1950? I really am not sure. Probably Western Red Cedar.